Sometimes you need a protein-packed meal without too much fuss. These are all ingredients I keep on hand in my pantry. Heat a medium pot with lid over medium heat. Add the oil and allow to heat through. Add the carrots, celery, and onions. Cook until everything has softened, about 5 minutes. Add the lentils, quinoa, tomato sauce, water, and spices. Stir well. Cover and bring to a boil. 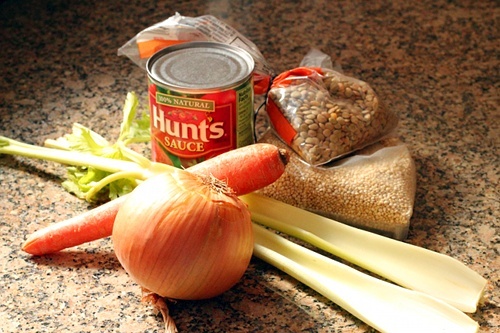 Reduce heat to low and simmer for about 1 hour, stirring occasionally, until lentils are soft. Serve. I did go a little crazy with the spices, so maybe it’s not quite as “basic” as it could be. I think you could go truly basic with just some salt and pepper and still have a delicious dish. (Maybe substitute some broth for the water.) Eat it plain, spoon over some greens, throw in a wrap — there’s all sorts of ways to mix it up. If you’re looking for more protein-packed recipes check out my Sweet and Smoky Dry Rub Tofu, Mushroom Nut Roast, or the Vegetarian Chicken Salad. I’m also sharing this recipe in Full Plate Thursday and Wellness Weekends. Mmm, what an awesome and easy recipe. Two of my fave vegetarian power foods for sure! Thank you so much for sharing your workout tips and this recipe for our Balanced, Healthy and Gluten-Free event Kalinda. We really appreciate your support! I love lentils and quinoa! This sounds very tasty! This looks great. My husband likes things with a lot of flavor so I think this will work. 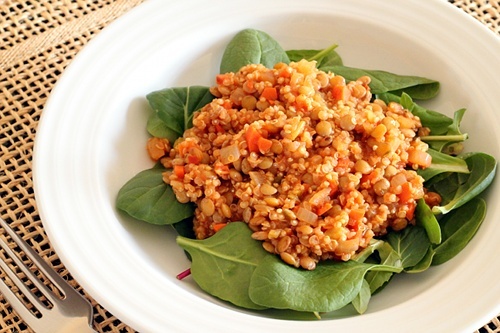 Lentils are one of my favorite go to pulses to go to because they are sooo high in protein. I liked how you mixed them together to help balance out the texture of the lentils with the quinoa. These two make a great pilaf as well! Pilaf sounds great, I’ll have to try it sometime. Thanks for posting! Quinoa is one of my all time favorite foods – just ate some tonight, topped with braised bok choy. 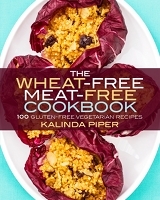 My husband and I eat vegetarian ever other night – I’m looking forward to perusing your website for more recipe ideas! I don’t cook enough with bok choy, and braised bok choy sounds wonderful. Thanks for the idea. I love indoor rock climbing and used to do it all the time when I was a kid – as young as five! I’d still love to do it. I also really like quinoa, although I’ve never tried before putting it with legumes or even combining it with other grains. What a great idea! Yes, I’ve been waiting for another climber to chime in. We’re pretty new and still pretty bad. We have seen plenty of great climbers, young and old. Yum, this sounds amazing and it looks totally hearty. I have been on a major lentil kick this week. I made lentil soup and I plan to make a vegan “meat” loaf with the leftover lentils. I hope you post the meat loaf recipe. I’ve not yet perfected a lentil meat loaf. Great minds think alike and all … my recipe for this event (tomorrow is my day) is a higher-protein pilaf with buckwheat, quinoa and sunflower seeds. I love the simplicity and flavor profile of this recipe! How are you doing today? It looks like you have brought me a wonderful lunch, I would just love this recipe, it looks delicious! Hope you are having a great week end and thank you so much for sharing with Full Plate Thursday. Yummy! This recipe works great for my use-things-up-from-the-pantry meal planning this week. And thank you for the gentle nudge to exercise…it really is great when you make yourself find the time and o something you enjoy. I’d probably use an extra cup of vegetable broth. I made this recipe tonight with no modifications and loved it! I will definitely keep it on-hand for future dinners. Thank you! My friend brought this for our “GirlFriends Lunch” it was truly lovely. It was out of my comfort zine altogether but it was so yummy. \i’m glad \i have the recipe now! I\’ve done this a few times now and it\’s a good and easy recipe. This time I doubled all the spices except salt and now it\’s perfect for my taste. Thanks for this awesome recipe, will most certainly cook this occasionally in future too. It\’s even better reheated in my opinion.